Both Tawny Emperor and Hackberry Emperor are species whose range is largely to the south of Massachusetts, but they are moving north. Their ongoing presence in the southern Connecticut River and Housatonic River valleys has only recently come to light. They may be expanding in range and numbers here as a result of climate warming. Widespread planting of their host tree, Hackberry, has facilitated the movement. By the 1950’s, Klots (1951: 119, 120) reports the range of both Emperors, A. clyton and A. celtis, as including “southern New England.” This apparently meant Connecticut, since there are specimens of A. clyton in the Yale Peabody Museum dating mainly from the 1950’s, but also one from 1920. However, there are no museum specimens from Rhode Island or Massachusetts prior to 1959. The first documented specimens from Massachusetts appear to be those from the large numbers of larvae reported by W. J. Reinthal on hackberry trees on the University of Massachusetts campus at Amherst in the years 1957-1959. About 37 Amherst specimens are now in the Yale Peabody Museum. However, these could have been introduced at Amherst, since Dr. Reinthal was working on breeding Tawny Emperors. There are also two undated specimens from nearby Holyoke in the Carnegie Museum. By 1975, Roger Pease had found Hackberry Emperor at Forest Park in Springfield, and shortly after that found Tawny Emperor larvae there as well. By 1988, he had reared both A. clyton and A. celtis from larvae found on hackberry trees there (Lep. Soc. News, Season Sum. 1988). But adult Tawny Emperors were not actually located during the 1986-90 Atlas period. Massachusetts Butterfly Club records for this species begin in 1997, when Tom Gagnon began leading trips to the Forest Park site. The main host in Massachusetts is Hackberry tree, Celtis occidentalis. Tawny Emperor will also use Dwarf Hackberry Celtis tenuifolia and Sugarberry C. laevigata, but these species are rarely found in the northeast, whereas C. occidentalis is native to and found in every county in Massachusetts except Barnstable (Cape Cod), Dukes (Martha’s Vineyard), and Nantucket (Sorrie and Somers 1999; Magee and Ahles 1999). It grows in moist bottomland as well as dry upland situations, and also does well in parks and along urban streets. Neither Tawny nor Hackberry Emperors are known to have adopted any new or non-native host plants, and they are not among the Switchers (Table 3). Tawny Emperor and Hackberry Emperor coexist in much the same habitat over most of their continental range (are sympatric), and even utilize the same host trees. But they do seem to be ecologically separated. Friedlander (1986/1987: 229) proposes that A. clyton and A. celtis are separable by the time of day when they are active: in northern localities Tawny Emperor is more active in the late afternoon, while Hackberry Emperor seems more active at mid-day and at higher temperatures. Also, Tawny males are more often found outside the tree canopy, while Hackberry males are found within it; this may also relate to temperature. Larval feeding habit is another mechanism of specialization. Tawny Emperors feed communally and are able to skeletonize mature leaves whereas Hackberry Emperor larvae concentrate on fresh growth, feeding singly or in small non-gregarious groups (Friedlander 1986/87; Scott 1986; Cech and Tudor 2005; see also “Broods and “Flight Period” below). And finally adult Tawny Emperors have their single flight somewhat in-between the two Hackberry Emperor flights, and avoid competition in that way. Like Hackberry Emperors, adult Tawny Emperors feed from soil, dung, carrion, rotting fruit and tree sap. They only rarely visit flowers for nectar. A. celtis celtis and A. clyton clyton are separate species, and all attempts to interbreed them have failed, although pairings with some other subspecies will produce viable offspring in laboratory situations (Friedlander 1986/1987: 230). In Massachusetts, MBC records 2000-2007 rank both Tawny Emperor and Hackberry Emperor as Uncommon to Rare, about on a par with Early Hairstreak, White M Hairstreak, and Hessel’s Hairstreak (Table 5). Surprisingly, Tawny Emperor has been somewhat easier to find that Hackberry Emperor, even though throughout its range it is usually the rarer of the two, perhaps overlooked because it flies higher in the trees. Chart 62 should not be taken to indicate any abundance trend. Its main import is that Tawny Emperors have been seen every year 1997-2009. In fact, they have been seen every year 1997-2013. A list-length study of MBC data 1992-2010 found a statistically significant 353% increase in detectibility (presence on long trip lists) of this species over that time frame, but that mainly reflects starting from zero in 1992. The especially large number in 2004 reflects a newly-discovered colony at Mt. Holyoke State Park. Multiple visits and counts were made at that site that year, with a high count of 13 on 7/3/2004 by B. Benner, T. Gagnon, et. al. There are only four known locations for Tawny Emperor in Massachusetts: Forest Park in Springfield; Holyoke Range State Park in Hadley/South Hadley/Amherst/Granby; Sheffield (several locations); and Northampton (Northampton community gardens, and possibly West Meadows, which is now part of MAS Arcadia WS). There may well be locations in other towns, since Tawny Emperor can easily be overlooked as it flies fairly high in the tree canopy, and it may well be moving northward in the Connecticut River valley. Tawny Emperor has actually been reported from more locations in Massachusetts than has Hackberry Emperor. 1) The Forest Park location in Springfield had been known for Hackberry Emperor since 1975, and Tawny Emperor was discovered there in 1988. In BOM-MBC 1997-2013 records the highest Tawny Emperor count there is 4, seen on 8/11/2002, T. Gagnon, but at least one individual has been seen there every year 1997-2013, except that there were no reports in 2009 or 2012. Eggs and newly-hatched larvae (at least 11) were photographed there on 8/18/2007 by S. Cloutier (see Massachusetts Butterflies 29). 2) The Holyoke Range State Park location (Hadley/So. Hadley/ Granby) was discovered in 1997 by Carl Kamp, when he was hiking the Metacomet-Monadnock trail. Tawny Emperor has turned out to be more common there than Hackberry Emperor, though both occur. The highest Tawny Emperor count at this location is 13 on 7/3/2004, B. Benner, J. Wicinski, and T. Gagnon; only 3 were reported on 7/15/2010. After no visits (apparently) in 2011 or 2012, 4 were reported on 7/18/2013 by T. Gagnon. This location has been reported as part of the Northampton NABA Count. 3) In the town of Northampton, the community garden is the best known location, with the high counts being 3 on 8/2/2012 and 2 on 7/18/2013, T. Gagnon. Tom Gagnon has also found Tawny Emperor once or twice at West Meadows, a property which has now become part of MAS Arcadia Sanctuary (T. Gagnon, pers. comm. 2/6/2012). 4) In the town of Sheffield Tawny Emperor singles have been reported on the Southern Berkshire NABA Count in 2000, 2003, 2005, 2008, 2009, 2010, and 2012 but not 2011or 2013. Separate from the Counts, there have been sightings of 1 or 2 at several different locations within the town of Sheffield, including 6 reported from Bartholomew’s Cobble TTOR, on 7/30/2011 by T. Gagnon and F. Model ; 5 on 7/25/2012 in the Cobble and nearby roads by S. Moore, B. Volkle and F. Model "all up high in hackberry trees"; and 5 on 7/27/2013 in the Sheffield/Ashley Falls area by M. Arey, A. Grkovich and G. Morrill. COLLECTORS PLEASE NOTE: DUE THE RARITY OF THIS SPECIES IN THE STATE, AND THE SMALL SIZE OF KNOWN COLONIES, PLEASE DO NOT TAKE SPECIMENS. The Tawny Emperor is univoltine, and has a more compressed flight period than the bivoltine Hackberry Emperor. It emerges later from chrysalis, and stops flying earlier. According to MBC records the flight period in southwestern Massachusetts is from the beginning of July through mid-August whereas Hackberry Emperor adults have been found from mid-June through mid-September (http://www.naba.org/chapters/nabambc/flight-dates-chart.asp). Earliest sightings. In the 22 years of BOM-MBC records 1992-2013, the four earliest reports are 7/3/2004 (Holyoke Range SP, B. Benner, J. Wicinski, T. Gagnon; 7/5/2007 (Sheffield, M. Lynch and S. Carroll); 7/7/2004 (Springfield Forest Park, T. Gagnon); and 7/8/2012 (Sheffield, B. Benner et al.). Latest sightings. In the same time period, the four latest reports are 8/21/2005 (Northampton community gardens, B. Benner et al. ), 8/20/2011 (Springfield Forest Park, T. Gagnon), 8/18/2001 (Springfield Forest Park, S. Selkow), and 8/17/2013 (Springfield Forest Park, T. Gagnon). The 1986-90 MAS Atlas did not have early or late flight data for this species. 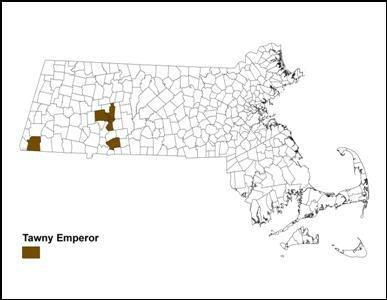 In the northern part of its continental range, Tawny Emperor is known to have only one generation (Opler and Krizek 1984), and that appears to be the case in Massachusetts. For Ithaca, New York, Shapiro (1974) reported a single brood, July 15-28. Compared to those dates, flight time in Massachusetts appears to start somewhat earlier and last somewhat longer, but there is still no evidence of more than one brood. Larvae have been reported hatching as late as 8/18/2007 (Springfield Forest Park, photos in Massachusetts Butterflies 29, 2007, S. Cloutier), and on 8/2/2004 (Northampton, D. Case). Third-instar larvae overwinter in rolled, silked leaves at the base of the tree. In spring, they ascend the host tree again and begin feeding individually on new leaves (Allen 1997). In Connecticut, the flight period is evidently longer, June through August, but the 1990-95 Atlas authors still believed that there was probably only a single generation (O’Donnell, et al. 2007). Tawny Emperor has recently been found in both Vermont and New Hampshire, although not in Maine. Further searches along the Connecticut, Housatonic, and other river valleys through Massachusetts might yield more occurrences. This species has not yet been reported from Rhode Island, although Hackberry Emperor was found there in 2008. 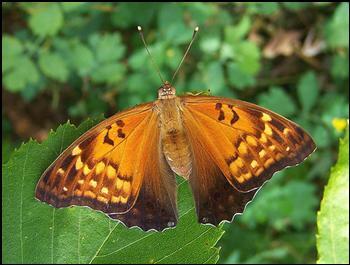 Tawny Emperor, like Hackberry Emperor, is state-listed as a Species of Greatest Conservation Need in Vermont ( http://www.vtecostudies.org/VBS/sgcn.html). The first verified state record for Vermont was in 2002 in Colchester. Though it is rare in Vermont, there have now been multiple sightings and specimens. Tawny Emperor flies in Vermont from June through August, with apparently one brood (McFarland and Zahendra 2010). Tawny Emperor remains rare in Massachusetts as well. It is not currently listed by BOM as a Species of Conservation Concern , since it may be expected to increase here with climate warming (Table 6). However, existing known occurrences should be monitored and protected.